You know someone loves you when they do something for you that you love even when they aren’t crazy about it. Such is the case with this cake. I love opera cake. My husband does not. He’s OK with it and will still eat it but it’s not his top choice when it comes to cake. Yet, whenever I request opera cake for my birthday or any other occasion, my husband will gladly make it for me. That’s love. 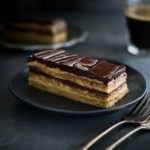 The origins of the opera cake are a bit fuzzy but most people agree that the classic opera cake consists of 3 layers of sponge cake soaked with coffee syrup, 2 layers of coffee buttercream, and 2 layers of chocolate. Unlike classic recipes though, this one uses a clever trick to create the 3 sponge cake layers. Rather than baking the layers in 3 separate pans, you bake one cake in a shallow 15×10-inch baking pan and then cut it into 2 squares and 2 rectangles to make the layers. The two rectangular pieces are put together to make the middle square layer. Since my husband had always been the one making this cake, I hadn’t ever made an opera cake before last week. However, I really wanted to post this recipe in time for Valentine’s Day and decided I would make the cake myself. Let’s just say I learned a lot from the experience since I ended up having to make the cake twice. But don’t worry, I’m going to share everything I learned with you. This isn’t a particularly difficult cake to make (it can actually all be done in a few hours) but here are a few tips that I think you’ll find useful. 1. Use the right size mixer for the job – Trying to beat 2 eggs in my large upright mixer was pretty ineffective. It seemed like only the top of the eggs was getting whipped which didn’t allow enough volume to develop and my cake ended up dense rather than light and airy. I had much better luck when I used my handheld mixer. If you have a smaller stand mixer, you should be fine to use it as long as the eggs are being thoroughly beaten. 2. Don’t over bake the sponge cake – I didn’t pay enough attention the first time I baked the cake and let it get too brown which did nothing to help the already too dense texture. The top and edges of the cake should barely be golden. They should be even lighter than what you see in the photo above. 3. Be patient brushing on the coffee syrup – You want to allow enough time to let the coffee syrup soak into the cake layers. Initially, it will look like there is too much coffee syrup for the cake but you’ll be surprised how much liquid the cake can absorb. So brush on some syrup, let it soak in and then brush on some more. The top most layers of buttercream and chocolate glaze should be on the thin side. So err on the side of using too much buttercream and chocolate in the middle layers than on top. Needless to say, this is an indulgent cake. However, all the flavors work so well together, I never feel it is over done. I like this particular recipe because it makes a very manageable sized cake. Of course, there are times when you want a big, tall over-the-top cake but sometimes those cakes can be a bit overwhelming, both to make and to eat. This recipe makes a relatively small 7-inch square cake that is only a few inches tall despite the many layers. However, don’t let its smaller size lead you to believe it is any less impressive. This cake still has plenty of wow factor. Heat oven to 425 degrees. Butter a 15×10-inch rimmed baking pan, then line bottom of the pan with a sheet of parchment paper, leaving a 1-inch overhang on short sides. Generously butter the parchment paper and then dust the pan with cake flour, knocking out excess. Set aside. Beat whole eggs in a large bowl with a handheld electric mixer at high speed until eggs have tripled in volume and form a ribbon when beaters are lifted, 5 to 10 minutes. Reduce speed to low, then add almond flour and confectioners sugar and mix until just combined. Fold in cake flour. Set aside. Beat egg whites in a bowl with cleaned beaters at medium speed until foamy. Add cream of tartar and salt and beat until whites hold soft peaks. Add granulated sugar, then increase speed to high and beat until whites just hold stiff peaks. Fold one third of the beaten whites into almond mixture to lighten, then fold in remaining whites. Fold in melted butter, then pour batter into prepared baking pan. Using an offset spatula, gently spread the batter in the pan until it is even, being careful not to deflate. Batter will be about 1/4 inch thick in the pan. Bake sponge cake until the top is very pale golden, 8 to 10 minutes, then cool in pan on a rack while preparing the coffee syrup, buttercream and chocolate glaze. Stir together espresso powder and 1 tablespoon water until powder is dissolved. Set aside. Bring sugar and remaining 1/2 cup water to a boil in a small saucepan, stirring until sugar is dissolved. Reduce heat and simmer syrup, without stirring for 5 minutes. Remove from heat and stir in Cognac and coffee mixture. Bring sugar and remaining 1/4 cup water to a boil in a very small heavy saucepan, stirring until sugar is dissolved. Boil, without stirring until syrup registers 238 degrees on a thermometer. While syrup boils, beat yolks in a large bowl with cleaned beaters at medium speed for 1 minute. When sugar syrup reaches the correct temperature, with the mixer running at medium speed, add the hot syrup to the beaten egg yolks in a slow, steady stream (try to avoid beaters and side of bowl), then add coffee mixture and continue beating until mixture is completely cool, 3 to 5 minutes. Beat in butter, 1 piece at a time, and until buttercream is thickened and smooth. Put the butter and chocolate in a microwave safe bowl. Microwave for 1 minute on high power and then stir the mixture together. If there are still chunks of unmelted chocolate, microwave the mixture again for 30 seconds and stir to combine. Continue microwaving the mixture in short increments and stirring until all the chocolate is melted and the mixture is smooth. Cool the glaze until it reaches room temperature but is still liquid. Loosen edges of the cake from the pan with the tip of a small knife, then using the parchment paper overhang, lift the cake from the pan and transfer the cake (on paper) to a cutting board. Trim outside edges of the cake. Cut cake into strips and squares (see Notes for measurements). Put 1 cake square on a cake plate, then brush generously with one third of coffee syrup (about 1/4 cup). Spread half of buttercream evenly over top with an offset spatula, spreading to edges. Arrange the 2 rectangular cake strips side by side on top of the cake to make a square, then brush with half of the remaining coffee syrup. Spread half of glaze evenly over top, spreading just to the edges. Top with remaining cake square and brush with remaining coffee syrup. Spread remaining buttercream evenly over top, spreading just to edges. Chill cake until buttercream is firm, about 30 minutes. Reheat remaining glaze, if necessary, until it is shiny and spreadable (but not warm to the touch). Pour glaze over top layer of cake and spread evenly just to the edges. Chill cake until glaze is set, about 30 minutes, then trim edges slightly with a sharp serrated knife if you want neat edges. First cut the cake in half crosswise, cutting through the paper used to line the pan. Then cut off a 3 1/4-inch wide strip from the bottom of each half so that you have a total of 2 (roughly 7-inch) squares and 2 (roughly 3×7-inch) rectangles. Recipe adapted from Gourmet, Sept 2004. The creation of the cake goes back to 1955 when great French pastry chef Cyriaque Gavillon worked at the legendary Dalloyau shop in Paris, supplier to the court of Versailles. This talented pastry chef wanted to create a cake that could be eaten in one bite while releasing a balanced flavour. He finally came up with a beautiful cake composed of 3 layers of sponge cake steeped in coffee syrup, topped with coffee butter cream and chocolate ganache. The cake layers reminded Gavillon’s wife of the Paris Opera House, so the name stayed and the Opera cake was born! Some origin stories date the invention of the cake back to 1903 when Louis Clichy presented it at the Exposition Culinaire in Paris. I think the real origin may be lost to time. Regardless of its origin, it’s definitely a delicious cake!